When it comes to investing, some people can get caught up with all the Euro mess in Europe, the fear of the fiscal cliff in the United States and Apple talk. While it is fun to discuss, it can also be misleading and cause you to miss opportunities. 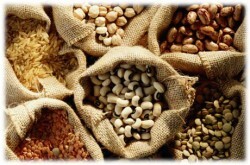 Not all investments are equities – have you considered commodities. Uncorrelated returns are what you want and in soft commodities is where you can get it. As Jim Rogers said, “Commodities tend to zig when equity markets zag.” I will breakdown what a soft commodity is how someone can capitalize on this market. This usually refers to products that are grown and sometimes tropical, not mined. They play a big part on the futures market and are often used by farmers wishing to lock in a future price for their harvest. These include sugar, cocoa, cotton, coffee and orange juice. Seasons: Each commodity can have different seasons and you should know when each season starts and ends. Often times there is a big run up or drop down in price depending on the planting estimates. It is best to sit on your hands until you have enough information and a good entry point. Price: By looking at charts, you can see the current and historical price levels of certain commodities. Be careful buying too high and if price is dropping wait for it to stabilize. This website gives up to date quotes on all soft commodities. Below is a chart for Sugar, as you can see price has leveled off around $19 which might signal an opportunity to buy. Market conditions: It is important to stay up to date on supply and demand reports as they are released. The USDA website provides excellent information on the world markets. Weather: If you have a knack for predicting weather, then this might be perfect for you. Obviously, watching weather patterns and how they affect crops is important. A good example is the drought in North America last summer where there were initial reports of hot weather and it never let up. This resulted in Corn and Soybean prices skyrocketing. If an investor got in after reading the initial reports, he could have done quite well. Research: As it goes with any investment, you should know what you are buying inside and out. Use Google and agriculture websites frequently to find information. Also, it could help by talking to farmers or seed suppliers to determine which direction the market is going. Traditionally, yes but that was when commodities meant trading futures, with all the leverage and potential for loss that implies. These days ETNs (see section below) take much of the risk out. A soft commodity might be volatile, but it does ultimately have a firm floor. 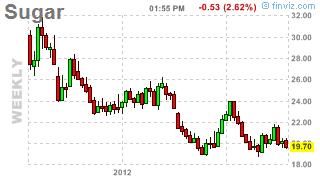 No grain or soft commodity like wheat can fall to zero. An individual share or company can. If wheat falls then farmers switch to other crops or to producing other things (like grazing cattle). Supply can, in many circumstances react pretty quickly, both in removing excess supply when prices are low and adding supply when prices are high. Of course this depends on the crop. Tree-based crops like coffee or cocoa have more lags on the way up and down due to the time it takes to get trees producing and also due to the cost of removing supply. Annuals like wheat, corn, sugar and soy however can respond quicker. If you are patient and what until you’re the particularly commodity is at a year or multi-year low, then much of the risk has been removed from your investment. How do I enter this market? If you want to directly invest in commodities, traditionally there was only one way to invest (futures contracts), but things are changing so you no longer need to trade and understand derivatives. Use an Exchange Traded Note (ETN – a relative of an ETF) that tracks the future contract or buy the future contract directly itself. I prefer using ETN’s as they are cheap and above all, easy to use. Buying futures contracts requires a futures account and is quite complicated, so it isn’t really worth the hassle for most investors. The most active ones that offer the best liquidity are BAL (cotton), SGG (sugar), NIB (cocoa). Also, when buying shares make sure to use limit orders as there could be a wide big/ask and market orders could get filled at a bad price. When you have chosen a price your willing to pay, be patient and try not to chase the price. Also, this investment can be short term one (1-6 months) since prices tend to have various peaks and valleys it doesn’t make a good long term investment. Americans might want to take that into consideration as they will get hit with capital gains tax of 35% if held less than a year. Overall, if used correctly an investment in soft commodities can be a strong weapon to add to your arsenal. Uncorrelated and purely based on supply and demand makes it less susceptible to media attacks that most stocks are. They do have some good volatility that if timed right can reap strong returns.